MyPhone releases myX1, an 18:9 phone for PHP 2799! 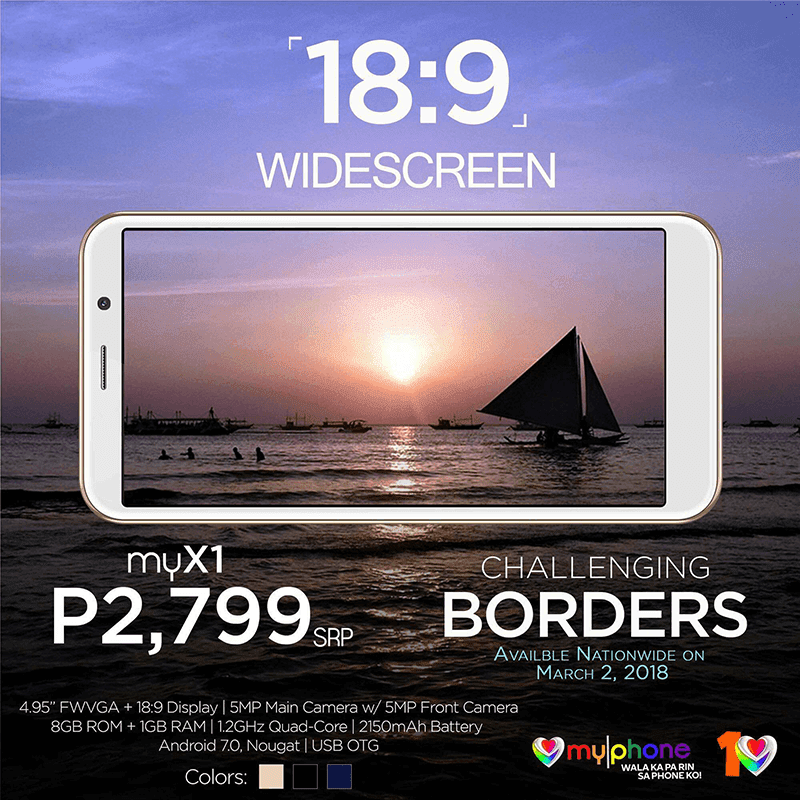 Home / mobile / myphone / news / MyPhone releases myX1, an 18:9 phone for PHP 2799! MyPhone is making some noise with their latest smartphone named the myX1. It is an entry-level phone with an 18:9 touchscreen display that is priced PHP 2,799. 18:9 MyPhone MyX1 is priced at PHP 2,799! The myX1 will have a 4.95-inch FWVGA display with an aspect ratio of 18:9. It will house a 1.2 GHz processor, 1GB of RAM and 8GB of expandable storage. It also has a 2,150 mAh battery. These specs are pretty decent when it comes to a budget, entry-level smartphone. The main camera will be sporting a 5MP sensor. The selfie camera will also sport a 5MP sensor as well. It will run Android 7.0 Nougat and will have USB OTG capabilities. It will also be available in three color variants as well. The MyPhone myX1 will be officially launched on March 2, 2018. The MyX1 is the most affordable 18:9 smartphone to date at just PHP 2,799.